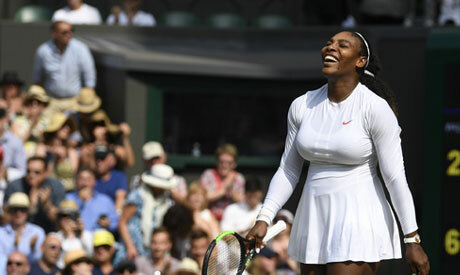 Serena Williams demonstrated that having a baby had not robbed her of any of her phenomenal tennis skills when she became the first mother in 38 years to reach the Wimbledon final, with a 6-2 6-4 demolition of Germany's Julia Goerges on Thursday. Goerges had come into her first Grand Slam semi-final having belted more winners (199), more aces (44) and more unreturned serves (113) than anyone else in the women's draw but those statistics counted for little when she came up against an opponent who is in hot pursuit of a record-equalling 24th major. "It's crazy. I don't even know how to feel because I literally didn't think I'd do this well in my fourth tournament back in 16 months," said the American, who won the 2017 Australian Open while in the early stages of her pregnancy. "When I don't have anything to lose, I can just play so free and that's what I'm doing. "This is not inevitable for me, I had a really tough delivery and multiple surgeries and almost didn't make it to be honest. I couldn't even walk to my mailbox, so it's definitely not normal for me to be in a Wimbledon final. That enjoyment was clear to see as she dashed Goerges's hopes of setting up an all-German final with Angelique Kerber in 70 unforgiving minutes. In each set Goerges was broken in the sixth game and she simply did not have the firepower or belief to stop the seven-times champion from surging to a 20th successive win on the hallowed turf. Williams was back giving the crowd a one-arm raised victory twirl after reaching a 10th Wimbledon final when her opponent swiped a lob behind the baseline. At 181st in the world, Williams is the lowest ranked player to reach the women's final but that number will fool no one, and especially not Kerber who was runner-up to the American in the 2016 final.